Since the barcode scanner was first introduced in 1974 and Wrigley’s Gum became the first item to have a barcode on its packaging, barcodes have largely been regarded as the most convenient way for retailers to look up information about an item and keep track of inventory. Barcodes are quick, accurate, and easy to use, leaving little paper waste and little room for human error; it’s no wonder that they’re so widely used. Although barcodes are easy to use and inexpensive, they are very limited in the amount of information they can encode. In the last 10 years, new technologies have been developed that can encode much more and varied types of data. This stated, significant changes to the barcode system have been looming. The indication of changing tides first occurred in 2003, when WalMart required all of their suppliers to adopt RFID tagging for their items. And yet, even as RFID tags and QR codes have become viable options for many groups, the majority still consider barcodes the most effective way to handle the circulation and inventory management of equipment. Can we expect to use barcodes for the foreseeable future? And what’s next for each type of this wireless tracking technology and equipment inventory software? Let’s start with a quick primer. A barcode, defined as “a machine readable form of information on a scannable visual surface,” is a set of lines of varying widths and heights, and a sequence of letters and numbers. When scanned with a barcode scanner, the sequence is returned. The barcode is used most often in retail settings, where it’s printed and attached to an item to be scanned for an inventory check or purchase. The scan returns the item code, prompting a lookup into the POS (point of sale) or inventory management system. In the retail setting, the barcode is an easy way to identify an item for pricing while letting retailers maintain accurate inventories and sales data. The barcode is also used in other settings such as libraries, hospitals, and punch clock systems. The fact that barcodes have been around for over 40 years is a testament to their advantages. They’re quick, accurate, and easy to use. They leave little paper waste and offer immediate, though limited, data and reduce labor costs. On the downside, it is time consuming to print or procure labels and affix them to items. Barcodes require investment in other technologies as well, such as readers or scanners. Even though barcodes are commonplace for many groups, we can still expect to see innovations regarding how they’re used in the future. For example, invisible barcodes are being developed as ways to protect consumers and retailers from fake or counterfeit products. The “invisible barcode” uses microparticles that are nearly invisible to the naked eye, and with a base material of pure silicon dioxide, the tag is also edible, has an infinite lifespan, and can withstand extreme conditions. They’re also impossible to remove and can be recovered even if the product is destroyed. By using invisible barcodes, companies in industries that see many instances of counterfeiting can help cut down on the number of fake products in circulation. A QR code is a type of barcode that encodes information from left to right as well as up and down. Also known as a matrix barcode or a 2D barcode, the main difference between QR codes and barcodes is that QR codes can be encoded in two different directions at once- meaning they can hold more data, and they can also encode varied types of data, such as text, URLs, SMS messages, e-mails, or a virtual business card. QR codes are used most often in manufacturing inventory management for the tracking of vehicles and other products in the manufacturing process. Most consumers recognize QR codes from marketing efforts that ask them to use their smartphones to scan a QR code for extra information or a promotional code. QR codes are ideal largely because they’re so easy to use. They’re versatile and easily tracked for analytics. They provide quick access to mobile customers, and it’s free to create QR codes. However, many users don’t want to have to download a QR reader for their phone; in fact, a recent survey indicates that only 6.2% of mobile users use their phone to scan a QR code. Despite the fact that QR codes haven’t been widely adopted yet by consumers, the future is bright for QR codes, with many interesting and unique applications in the works. For example, Mercedes-Benz Canada has begun using QR codes on its vehicles to give rescue teams important vehicle structural information, such as the location of vehicle components like the airbags, battery, and fuel tank; this data can be used to speed up rescue procedures in an automobile accident and save more lives. More unusually, QR codes have recently been used in headstones (to link visitors to online tributes to the dead as well as organize and archive information) and to display holograms. RFID, or Radio Frequency Identification, allows the reading and capture of information stored in tags via radio waves. The system consists of two parts- a tag or transponder and a reader- that pass signals to one another. Currently, RFID tags are used a wide variety of industries, ranging among mobile payment, healthcare, retail, amusement parks, casinos, Redbox, gun control, and car rental. You’ve probably most commonly seen RFID tags used in theft prevention in retail (cashiers must deactivate tags before you pass through the scanner by the entrance to the store). RFID tags are also used to track animals, to open security-locked doors, to pay freeway tolls electronically, and to track things like shipping containers, heavy machinery, trucks, and railroad cars. In addition to their versatility, RFID tags are helpful because the scanners can communicate with multiple tags at once and they don’t need to be pointed directly at a tag or in a direct line of sight in order to receive a signal. RFID tags are small and less invasive, yet they’re also tough enough to withstand damage. Interestingly enough, the seeds of RFID technology were developed by the Russian military in the latter stages of WWII as a listening device, and one concern with the technology now is its potential to be used as a corporate espionage tool. Furthermore, the fact that the signal can be read by any nearby reader can pose security risks, and people can also remove the tag so that it doesn’t trigger the security system. The final, and perhaps most commonly cited downside, is that RFID tags also require high startup costs. The future is nonetheless bright for RFID tags. In the fall of 2014, the NFL adopted RFID technology to track player speeds, distance, and patterns on the field by adding RFID tags to players’ shoulder pads, opening the door for data and analytics to play a great role in sports. What’s more, big brands in retail are starting to test the increased capabilities that RFIDs offer. On a more intriguing note, researchers are starting to experiment with using RFID tags as the next wave of wearable technology through implanation. Doctors can implant a tiny RFID tag (about the size of a grain of rice) under a person’s skin, and that tag can be used for anything from starting your car or paying for lunch to tracking your heart rate. 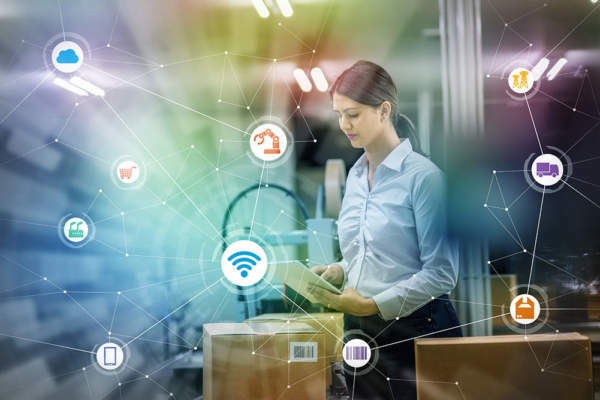 For the moment, companies don’t seem to be moving away from barcodes and QR codes- especially smaller businesses without the funds to spend high startup costs on RFID tags and scanners. But while mobile barcode scanning seems to be increasing, the advantages of RFID technology (its versatility, the fact that it’s more easily secured from data breaches, and the technological improvements that are closing the price gap) are making RFID more viable in manufacturing and retail settings – and paving the way for it to be the wireless tracking technology of the future.